A new commercial for Thomson Holidays hit our screens over the festive season. Like most holiday companies, Thomson think that the moment we’ve polished off the turkey sandwiches our thoughts turn to going somewhere exotic. For the vast majority of the UK they’re probably right, but will this ad convince them to book their big summer breaks with Thomson ? I think not. The ‘ Time for a holiday ?’ commercial adds vocals provided by Sunday Girl ( Jade Williams) to producer Guy Farley’s reworking of the Pixies’ 1988 rock song ‘Where Is My Mind?’ which was used as an instrumental on Thompson’s previous holiday ad. It’s a beautiful track, the vocals sit well, and the images are edited nicely to the music but overall it’s too reflective and melancholy for me. I have no idea what ‘We’ve designed one that’s right for you’ means either. Holidays are all about escape, excitement and relaxation. Ironically Thomson themselves captured all of this in 1984 with a TV commercial featuring This Mortal Coil ( a.k.a The Cocteau Twins) singing Tim Buckley’s astonishing‘ Song to the Siren’. It’s a breathtaking piece of music with its dreamy vocals and eerie guitar and it took the ad world by storm back in the day. There are far too many reflective music tracks around like this in ads at the moment and they don’t always fit the brand. Lynx did it best in 2004 when they used the Israel Kamakawiwo’ole version of ‘Over the Rainbow’ to great effect on an award winning cinema and TV commercial. John Lewis do it well, tugging on our heart strings with their re-recordings of classic tracks. 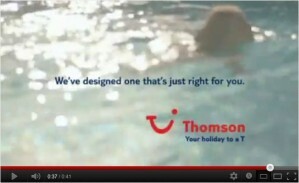 But for me Thomson feel like they’re doing nothing more than jumping on a musical bandwagon and it’s the wrong one.